Home / 2019 / January / 23 / Copy cats: When is a bobcat not a bobcat? Is it a bobcat or a lynx? Even experts, when using publicly-submitted images, have trouble telling the two wildcats apart. Photo credit: James Gagnon. Two UBC Okanagan biologists, who have publicly solicited images of wild cats for their research, say telling the difference between a bobcat or a lynx can be difficult. 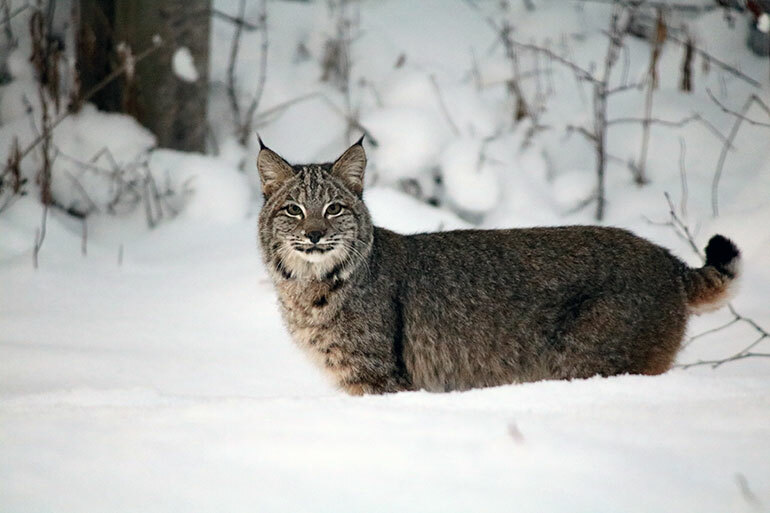 Biology Professor Karen Hodges and master’s student TJ Gooliaff collected and compared wildlife images for several years as part of their research tracking bobcat and lynx distributions in British Columbia. Camera trapping and solicitation of wildlife pictures through citizen science have become common tools in ecological research, explains Gooliaff. While it’s generally easy to collect many images of animals, some species are difficult to tell apart, making species classification challenging. There are some species, such as mountain goats and porcupines, where it’s obvious. But for others, including bears, deer, lemurs, wild cats and antelopes, classification to a species may be unreliable as the animals can be similar in size, shape or colour. It gets even trickier when the pictures are blurry, taken in poor lighting, show only part of the animal or when only one image is available for a given animal. In a 2018 study published in the Journal of Wildlife Management, Gooliaff and Hodges solicited 4,399 images of bobcats and lynx from the public across British Columbia to examine the provincial distribution of each species. They used pictures, trapping records and other data sources to develop current range maps. Because lynx and bobcats are similar, Gooliaff and Hodges then measured agreement among experts who were asked to distinguish between bobcats and lynx from those images. The researchers asked 27 individual bobcat and lynx authorities to classify the species in a subsample of 300 images to see how often the experts agreed on whether it was a bobcat or a lynx. What became clear was that the experts found it difficult to tell bobcats and lynx apart—indeed, many images were labelled as “unknown” by the experts—and they did not always agree with each other. Experts were inconsistent even with themselves, changing their classifications of some images when they were asked to reclassify the same pictures months later. Gooliaff and Hodges also examined if agreement among experts varied with what part of the animal was in each image (paws, head, tail, etc. ), the habitat in the background, and whether it was day or night. These factors all affected how many experts agreed on the species in each image. “These results are particularly troubling given that the images were all of high photographic quality,” says Gooliaff. Hodges says this study helps researchers improve how they work with images, by knowing when misidentifications are most likely. Further, classification of images of similar‐looking species should not be relied upon for critical conservation or management decisions. Instead, physical or genetic evidence should be required in these cases. She also emphasises that pictures provided by the public are becoming a powerful tool in wildlife research and eventual conservation and management efforts. This research benefits citizen science and image-based studies, as they continue to refine how people use submitted images. The image study, partially funded by a Natural Sciences and Engineering Research Council grant, was recently published in Ecology and Evolution.